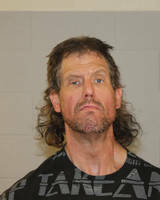 ST. GEORGE — St. George police arrested a 47-year-old-man Sunday night after an officer recognized him as a suspect with multiple warrants. After St. George resident Steven Richard Barton failed to appear at the Washington County Fifth District Court on May 14, Judge Eric A. Ludlow issued a bench warrant in the amount of $25,000, cash only, for his arrest, according to court documents. Eleven days after the warrant was issued, St. George Police Officer Doug Iverson saw Barton at Knight Storage in St. George and identified him as having outstanding warrants, Sgt. Sam Despain said. Barton was arrested and booked in Washington County’s Purgatory Correctional Facility on five second-degree felony warrants: two for $25,000, one for 10,000 and two for $5,000. According to Washington County Bookings information, total bail stands at $70,000. According to court documents filed on April 7, 2013, Barton was charged with a class-A misdemeanor for use or possession of drug paraphernalia, a class-B misdemeanor for driving on a suspended license and a second-degree felony for possession of a schedule 1 controlled substance. Arrests on warrants are newsworthy now? They have always been what rock have you been hiding under?